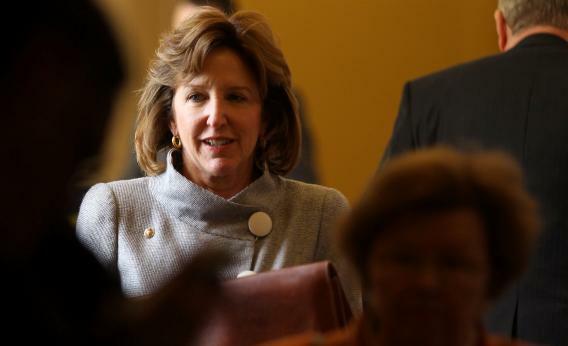 Kay Hagan endorses gay marriage. Today, on Facebook, North Carolina Sen. Kay Hagan became the second “endangered” Democrat from a Romney-voting state to endorse gay marriage. Like Alaska Sen. Mark Begich, Hagan won election in 2008, running ahead of Barack Obama, but helped by the Republican fade. Like Begich, she’s up in 2014. Her three-graf statement is an adroit exercise in legalese. Marriage equality is a complex issue with strong feelings on both sides, and I have a great deal of respect for varying opinions on the issue. After much thought and prayer, I have come to my own personal conclusion that we shouldn’t tell people who they can love or who they can marry. She hits the “religious freedom” button, too, arguing that gay marriage can be dealt with as a civil issue and no church need worry about being sued over it. One reason she’s so careful: North Carolina was the one state that actually passed a gay marriage ban in 2012. In May, by a 61-39 margin, voters passed Amendment One and added a traditional definition of marriage to the state constitution. Does that mean Hagan’s defying the will of 61 percent of voters? Not quite. Notice, again, that the marriage vote happened in May, not November. It coincided with the Republican primary. Only 2,157,980 voters cast ballots on Amendment One; only 1,317,178 voted “yes.” In November, more than twice as many voters would come out for the Romney-Obama context, and 2,178,391 would vote for Obama, even as he narrowly lost the state. Could the amendment have failed if it made that November ballot? Democrats didn’t think it would. They preferred to punt that fight and avoid a galvanizing social issue sharing the ticket with Obama and their lower-office candidates. Thanks to Republican gerrymanders, the lower-office candidates mostly got smoked anyway. But North Carolina’s far more divided on gay marriage than the Amendment vote made it seem.